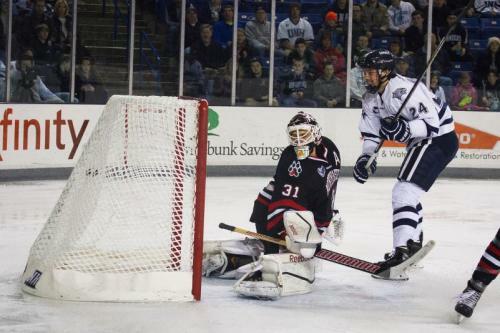 The UNH Wildcats earned their first Hockey East win of the season on Friday night, with a 5-3 victory over Northeastern University. The Wildcats built a 3-0 lead in the first period, but Northeastern was able to grind away and eventually tie the game up in the second period. UNH started the game as well as they have all season, scoring three unanswered goals in the first 12 minutes of the game. Collin MacDonald scored his second of the year going to the blocker side of Clay Witt. Tyler Kelleher fed MacDonald with a pass that split Jarrett Fennell and Colton Saucerman. The goal came just 1:58 into the period. Kelleher notched his second assist of the game at the 9:47 mark of the first period. On the rush, Andrew Poturalski took the puck inside-out, and fired a shot from the right circle. It beat Witt on the far side post for the freshman’s fourth goal of the year. Matt Willows added to the scoring just two minutes later, this time coming off a rare rebound from Witt. Grayson Downing fired a slap shot from the faceoff circle that went off Witt’s leg pad. Willows was in front of the net and slid it underneath Witt’s pads, who lost the puck in the scrum in front of the net, giving UNH a 3-0 lead. Northeastern was not to be denied, however, storming back in a 20-minute span starting with a powerplay goal at the 15:30 mark of the first period. Dan Correale was given a five-minute major penalty for Interference after hitting Mike Szmatula coming through the offensive zone. Mike McMurtry fired the puck from the right faceoff circle that Adam Clark was able to stop, but his long rebound was corralled by Colton Saucerman and buried for the sophomore’s fourth of the year. The Huskies almost got another one just a minute later off the stick of Tanner Pond, who had a scoring chance on a play nearly identical to the first goal. In the second period, Northeastern made the necessary adjustments to its game to generate offense. After an offensive possession that lasted almost two full minutes, the Huskies trimmed the lead to one on a score by Fennell. Receiving a pass from Saucerman at the high left point, Fennell ripped a shot that appeared to deflect off a body and beat Clark, again on the blocker side. The game was then tied at 3-3 barely two and a half minutes later, this time off the stick of Dalen Hedges. The sophomore fired a shot almost from the goal line that hit Clark under the arm and trickling into the net. The Wildcats were dormant for most of the second, and didn’t come alive until Kevin Roy was called for a needless slashing penalty behind the play at the 8:55 mark of the third. On the ensuing powerplay, freshman defenseman John Furgele tallied his first career goal on a one-timer from the point, giving UNH a 4-3 advantage with 6:57 left in the third. The Wildcats had two chances to extend the lead, but Clay Witt made a few critical saves to keep the Huskies close. In the third period, Matt Willows had a breakaway and tried to fake out Witt by going backhand-forehand, but Witt stuck his leg out and stoned the attempt. Andrew Poturalski also had a chance on a remarkable individual effort, diving to snag a stretch pass and shooting from his knees that Witt was able to get enough of. The final dagger came with under 30 seconds to play after Northeastern pulled Witt from the net. Despite having the extra attacker, the Huskies lost possession and Willows chased the puck deep into the NEU zone. He threw a blind pass in front that alternate captain Casey Thrush hammered into the net for the final tally, making it a 5-3 final. Due to a head injury, one of UNH’s key freshman Warren Foegele was out of action and won’t play in the next match up. UNH improves to an overall record of 4-5-0, while Northeastern slips to 0-8-1. The teams will finish the home-and-home series on Saturday at Mathews Arena in Boston, Mass.